It’s been over thirty years since two of the most legendary fighters of the 1980s met in what had to be one of the most anticipated bouts since the first title bout between Joe Frazier and Muhammad Ali. And that was on April 6, 1987, when undisputed middleweight champion Marvin Hagler 62-2-2 (52) defended the WBC title against the once-again-returning Sugar Ray Leonard 33-1 (24), who had fought only once in the previous five years and never as a middleweight. Hagler and Leonard had been on a collision course since the night of November 30, 1979, when Hagler got his first title shot and was held to a disputed draw by middleweight champion Vito Antuofermo. And Hagler’s title shot was an undercard bout that followed Leonard’s challenging and defeating Wilfred Benitez for the WBC welterweight title in the same ring an hour later. What’s more, Leonard became an overnight superstar and Hagler meandered in his shadow for years. And once Leonard retired due to a detached retina, it looked as if they would never meet. But Leonard couldn’t stay retired and became envious of Hagler’s replacing him as boxing’s alpha dog. Much like Ali and Frazier, Leonard and Hagler amounted to a superstar versus a regular guy who punched the clock. Leonard, like Ali, was a handsome guy whose calling card was speed and brilliance. Hagler was Frazier-like in that you wouldn’t want to meet him in a back alley. Hagler had big muscles, a bald head, and always felt he didn’t get the respect he deserved. The difference was that Frazier was more of a warrior stylistically and was never psyched out by any opponent. Hagler was a better boxer and preferred to pick you apart instead of bludgeoning you into submission like Frazier. And Hagler’s appearance and bravado fooled many into thinking he was Earnie Shavers in a middleweight body. And that misconception led many to believe he was too tough and strong for Leonard. Before the Hagler–Leonard bout in 1987, many believed Hagler was going to walk through Leonard the way Joe Frazier walked through Bob Foster or the way Mike Tyson destroyed Michael Spinks. And that’s because Hagler’s power and offense were perhaps a little overrated, and Leonard’s physical strength, chin, mental toughness—and even punch—were underrated. What’s more, the biggest mistake fighters made repeatedly against Hagler was thinking that to beat him you had to back him up, which was something that couldn’t have been further from reality. The fact was that Hagler was most lethal when his opponents voluntarily pushed the fight to him. If you check his record, the title challengers who attempted to bully him were all stopped inside the distance. It’s no coincidence, then, that the only two times Hagler was forced to go the distance as middleweight champion was when he fought against two smaller fighters, Roberto Duran and Sugar Ray Leonard, who had secured their legacies fighting at lightweight and welterweight. When Leonard finally challenged Hagler it should have raised a red flag in Hagler’s mind—mainly because during the previous five years it appeared Leonard was less interested in the fight than Hagler was. Then, after a grueling fight with the undefeated John “The Beast” Mugabi, six months later Leonard is all-in to meet Hagler? What changed? Perhaps it was Hagler looking a little less hungry and ferocious and his starting to mention that Mugabi may have been his last fight. Leonard was great, however, at reading his potential opponents in and out of the ring—and he always grasped that Hagler would never feel totally complete until he had Leonard’s scalp. And it’s not widely known that during his ring absence Leonard ran three times a week and went to the gym often, and therefore he never truly got out of shape. When Roberto Duran fought Hagler in November of 1983, he knew he couldn’t meet force with force because Hagler was too strong. So he moved away, made Hagler take the first few steps and commit, and then countered him. Leonard watched this from ringside as a broadcaster and later took it up a notch or two when they fought. When Leonard fought Hagler, he knew four things implicitly. The first was that Hagler wasn’t a single-shot life-taker, so the odds of his being stopped by any single punch in Hagler’s arsenal were low. Second, he understood that Hagler’s left cross from his southpaw stance wasn’t much of a finishing punch. And in order for it to be a factor at all, Hagler needed to steer his opponents into it. But if he was forced to reach or lunge with it, it was easier to avoid. And if it did connect, the impact wouldn’t be anything close to fight-altering. Third, Leonard understood that Hagler was decent at best when it came to cutting off the ring. In actuality, he followed his opponents more than he ever headed off their escape route. And since Leonard was much quicker than Hagler, he knew as long as he picked up his feet and didn’t pose, Hagler would either be stuck in the mud or fighting uphill. And last, Leonard figured out that Hagler’s best punch was his right hook and his cross and uppercuts served mostly to get his opponent to forgot about the hook. Since Hagler was a southpaw, he led with his right hand and Leonard knew it was doubtful he could set him up for something he didn’t see with his front hand—just to nail him with the right hook. During the run-up to the fight, Leonard messed with Hagler calling him more of a fighter than a boxer, and Hagler was insulted by that thought. But the ploy worked because, for a few early rounds of the fight, Hagler fought from a conventional stance trying to show Leonard he could box as well as fight—and in doing so Leonard clearly won the early rounds (lost rounds that eventually cost Hagler the fight). Also, it’s overlooked how much strength it takes to outbox a fighter like Hagler. But Leonard had an abundance of applicable ring strength that enabled him to keep Hagler from blasting through him and doing what he wanted. Hagler was only successful pinning Ray in against the ropes or in one of the ring corners when Leonard tired and needed a short breather and began to slow down. What’s more, Leonard’s strength combined with his legs prevented Hagler from being able to take advantage of his most significant advantage—his physical strength. Because Hagler had to constantly keep his feet moving to track Leonard down, he was never able to mount a sustained offense or get set, especially in the early rounds. Leonard continually beat Hagler to the punch and was almost always a step ahead of him, which forced Hagler to reach and miss wildly at times. The style in which Leonard fought Hagler wasn’t a surprise to any knowledgeable fight observer. And if Hagler thought Leonard was going to try and knock him out the way Thomas Hearns did two years earlier, it is astonishing that he could be so gullible. Leonard’s only chance to win was by boxing and using his speed, while at the same time taking advantage of Hagler’s unbalanced offense (he could only hurt Leonard from his right side). Not to mention that it was the style Leonard fought in every fight of his career with the exception of his first bout with Duran, who he was wrongly convinced he could overpower. If Hagler was shocked by Leonard trying to keep the fight from becoming a slugfest, shame on him. Sugar Ray Leonard boxed Marvin Hagler and forced him to fight away from his strengths while using what he did best—flurrying with the mindset of disrupting Hagler and not trying to hurt or drop him—which was something Ray knew could only fail, and open the door for Hagler to nail him. And to if anyone believes Leonard’s punches were slaps with a closed fist that had no power, then why didn’t a fighter with an all-time great chin like Marvin Hagler just walk through Leonard and force him to fight him off? The reason: Hagler felt Leonard’s power enough to know that getting careless could be a mistake. The thought that Leonard should have fought Hagler with his feet planted is misguided. Smart fighters like Leonard use all their tools, and overconfident ones like Hagler go in with no Plan B and believe toughness and superior strength will get the job done—only it didn’t. Hagler’s overconfidence led him to agree to a bigger ring and to the ten-ounce gloves Leonard preferred versus the eight-ounce gloves middleweights fight with most often. When you figure that Marvin was overconfident, that Leonard had studied him stylistically, and that Hagler wanted Leonard so bad that he agreed to his terms for more money, it’s clear that Sugar Ray Leonard had the fight won long before the first bell rang. And once the fight started, and Hagler realized Leonard was tougher and more durable than he ever envisioned, it was too late—and all he could do was try to bring more of what wasn’t working, which was his perceived and predictable physicality. Who would have won had they fought between 1980 and 1983 is anyone’s guess. Leonard always held the stylistic advantage, however, and would have always forced Hagler to fight away from his strengths (trying to cut the ring off moving forward and being too reliant offensively on one punch, his right hook). Hagler was faster and more tenacious then than he was in 1987, though; but, then again, Leonard was greater during those years as well. All we can go by is the fight they gave us, which was a greater event than it was a fight, although it was one of the better and more complete bouts both strategically and physically of Leonard’s stellar career—and he won it. Leonard was up 3–0 after three rounds. 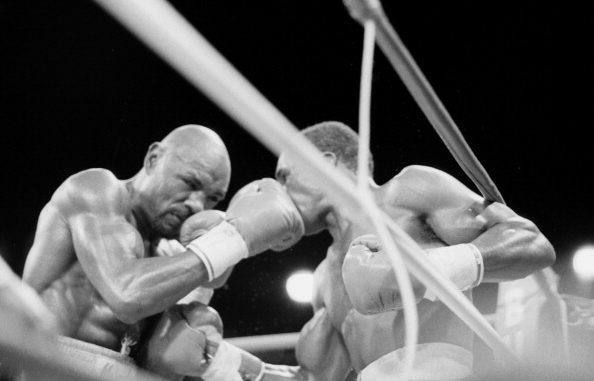 At best, Hagler won five of the last nine rounds, which makes it 7–5 Leonard, or 115–113. On top of that, there was not a two-point round in the fight. Although Hagler was the aggressor he wasn’t the effective aggressor, nor was he making Leonard pay the way he needed to when Leonard went to the ropes trying to come up for air. On the night Leonard challenged Hagler, he was better prepared mentally and he knew what he needed to do tactically more than Hagler, who thought that fight would be his signature win and that all he had to do was show up and scowl. 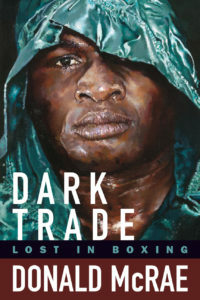 And if Hagler thought going in as the champ would benefit him if there were any close calls, he again was shortsighted. Because Sugar Ray Leonard was boxing’s biggest star and biggest draw during the decade of the 1980s, and that was bigger than Hagler’s alphabet titles.